There’s quite a lot to process with this card. The Discovery half is pretty strong on its own; it’s not quite comparable to the very highest tier in either blue or black card-drawing, but digging into your deck is often underestimated, and it’s another mana-efficient way to put three cards in your graveyard at once, if you choose to. I think Search for Azcanta is probably going to be the most popular card for brewers once Guilds of Ravnica is out. As for Dispersal – not to be confused with Disperse, which has somewhat similar game text too – it has an unusual wrinkle of not letting you choose which card gets bounced. That level of control over it is usually a must-have for bounce spells, but in this case, there are scenarios where the highest-cost card will be the most threatening anyway. Also, in control and midrange matchups you’ll often find yourself facing exactly one threat from the opponent, and resolving it will cause a major disruption. Discovery/Dispersal has a fair bit going for it. As always, being a split card affords it a fair bit of flexibility, and (conveniently) both modes are good! Let’s start with Discovery; it’s a weakened Preordain, sort of. Or a weakened Thought Scour/Mental Note! It straddles the line between the two blue spells, but it adds the wrinkle of being a hybrid spell, which is an underrated benefit at times. Being able to splash this in black, blue, or black and blue decks makes this a solid bit of filtering that might see play even as a standalone spell. Dispersal is removal, and it’s removal that is especially effective against decks that play out their hands (like Boros and Rakdos). Five mana is a bit high, but you’re getting rid of an expensive permanent they control all the same…at instant speed. It also hits all opponents, a nice bonus. 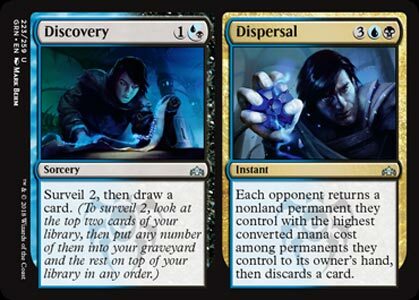 Dispersal is the weaker half of the card, but stapled to Discovery, it’s a lot better. When you have no need for filtering in the late game, you have the ability to turn an otherwise dead card into a high-impact play. It’s a solid part to the Dimir deck, even if the hybrid half draws the most attention! Next articleYu-Gi-Oh! TCG at NY Comic Con – Exclusive Playmat & more!